Roast a red pepper by baking at 350 for half an hour, or until skin begins to peel. You can do this the day before, or do a couple and keep them in your fridge. Cook ground lamb or beef in a cast iron pan. Season with salt, pepper, crushed fennel seed and a little bit of cinnamon. When it’s mostly done, add the asparagus and cook until bright green and still crunchy. Cook the pasta. Chop green garlic and roasted red pepper. Drain pasta, put it back in the pot you cooked it in, and stir in the meat, asparagus, garlic, red pepper, and a handful of grated Parmesan. 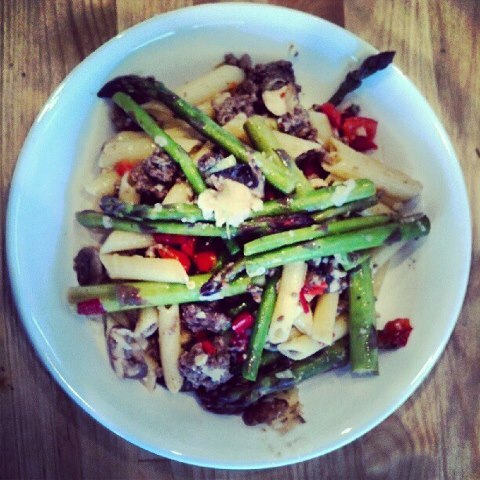 Tags: asparagus, dinner, lamb, pasta, recipes, roasted red pepper, spring. Bookmark the permalink.